The Queensboro Bridge in New York City crosses the East River and connects Long Island to Manhattan. For Carla de la Chapa, that bridge not only represented a mile in a marathon, but also a moment in a much longer journey. 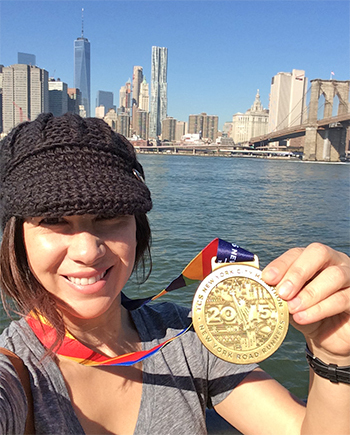 Carla, a manager here at CPS Energy in Customer Solutions and Delivery, completed the New York City Marathon in November, but her road to the finish line was more challenging than she ever expected. That road started five years ago. Carla’s mom had been diagnosed with cancer and was in need of a bone marrow transplant. A single mom and an admitted Type A personality, Carla was in need of something that could help her cope with a disease that offered no control. She found it in Team in Training, a support group of the Leukemia & Lymphoma Society (LLS) filled with cancer survivors. The group has an endurance sports training program that raises money for blood cancer research and that offered Carla a way to handle her new reality. “I went from the couch to the team. It sounded like a great idea,” she said. “I thought, this is a great way of coping. That year, Carla committed, trained, and finished her first 26.2-mile run at San Antonio’s Rock and Roll Marathon. Fast forward five years. It was time to celebrate – Carla’s mom was a cancer survivor. A family trip to Europe was planned to recognize the milestone. And Carla, who had leaned on running to help her through tough times, also wanted to mark the anniversary with a run in the New York City Marathon – her third marathon. Signing up for such an event is no small feat. Carla’s attempt to get in through the marathon’s lottery failed. Instead, fundraising for the LLS would be her ticket. That was the plan – train for the run and raise the funds needed to qualify. But just a couple of months into that plan, she began to feel tired and rundown. After a series of doctors’ visits and later a biopsy, she learned cancer had now found her, too. She was diagnosed with papillary thyroid cancer – a common and, thankfully, highly curable form of the disease. But now it was May and this wasn’t part of the plan. The vacation to Europe was set for June and she was already invested in the marathon in November. Her doctors let her proceed with the well-deserved trip to Europe. But soon after her return, she had surgery to remove her thyroid. Following a three-week recovery, she endured three more weeks of radiation. Despite the setback, Carla would not give up her goal to be in New York in November. While her treatments left her with little energy, she forged ahead with a few short runs. With every week, she improved. Running was a big part of her recovery. “At one point, after asking my doctors, I was progressing really well,” Carla said. “I made the decision to just finish the race, finish fundraising and not let it stop me. She eventually trained her way up to 16 miles – a worthy achievement but not the 20 miles she had hoped for going into the marathon. She made it to New York City and made it to the marathon. Fifteen miles in, she arrived at the Queensboro Bridge. That bridge, like all of the bridges on the course, was quiet and still, she remembers – somehow free of the endless noise typical of New York City. Carla celebrates finishing the New York City Marathon. Carla likely had been in this place before. Not in New York, but back home, when she learned her mother had cancer and when she was told she had cancer. With such news often comes the bewildering feeling of doubt and helplessness. Many have been on such bridges – in marathons and in life. But not everyone is lucky enough to find their way across. At the end of the Queensboro, a volunteer waited and warned runners to slowly exit the bridge. Hundreds of spectators were waiting ahead and it was a common mistake for runners to lose their focus as they passed through. Carla finished the marathon. While she didn’t win the race, she won the fight. Despite her challenges, Carla had found a healthy way to cope with life and a new sense of purpose. Carla won’t run in this Sunday’s Rock and Roll Marathon here in San Antonio, but she will be there to support our CPS Energy team as well as the Team in Training. She plans to participate in the Rock and Roll Marathon in Nashville next April. Whether she’s running or not, she will continue to be an advocate for the LLS and its mission to serve cancer patients and save lives. If you would like to support Carla and the LLS, see Carla’s Team in Training website.